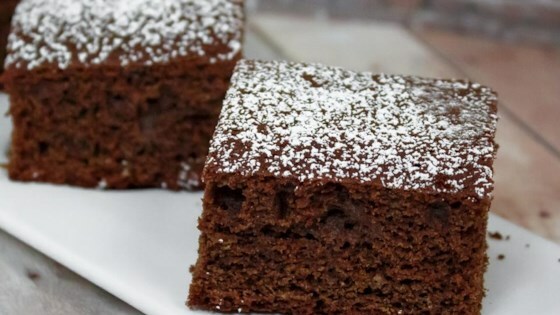 "A plain cake-like brownie, moist with great chocolate taste. Easy to make." Preheat oven to 350 degrees F (175 degrees C). Grease and flour a 9x9 inch pan. In a microwave oven or over a double boiler, melt shortening and chocolate together, stirring frequently until smooth. Set aside to cool. In a medium bowl, blend together the sugar, eggs, applesauce and vanilla until smooth. Stir in the chocolate mixture. Combine the flour, baking powder, baking soda and salt, gradually stir into the chocolate mixture. Spread evenly into the prepared pan. Bake for 35 to 40 minutes in the preheated oven, until a toothpick inserted in the center comes out clean. Cool in pan before cutting into squares. They were good, but more like cake then brownies. These were definitely very cakey, but they were also very tasty. Consider frosting it. Kinda bland, I made a chocolate frosting to put on when hot, so it made them more flavorful. I did not think they were all that moist either.